Here are some screenshots of Keysticks in action. When the program is running, you'll see a window shaped like a game controller that shows you what the controls are. 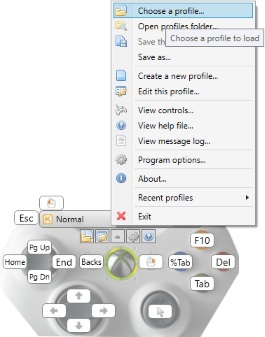 You can right-click the controller to access the program menu, or use the short-cut buttons. The example shown here lets you control the mouse pointer with the right stick, click using the left trigger, and so on. When you want to type some text, you just squeeze the right trigger to pop up the screen keyboard. The keyboard has word prediction to save you typing every word in full, and you can choose the layout you like best. Keysticks comes with some sample sets of controls ("profiles") to get you started. You can preview the profiles in the Profile Browser and download profiles created by other Keysticks users. You can design and customise the controls using the Profile Designer. 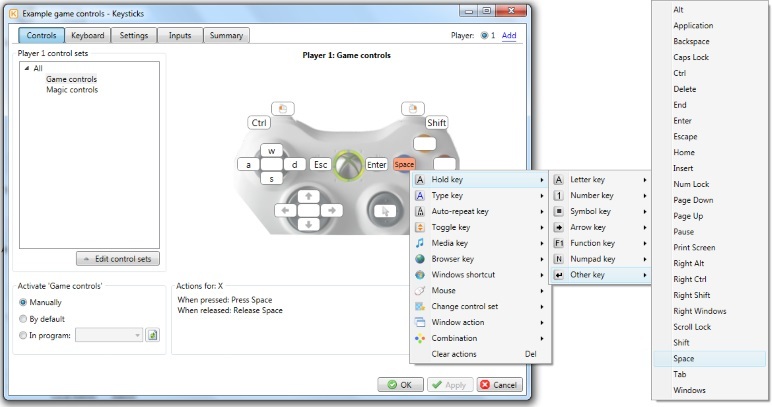 This is great if you want to create your own controls for games. The quick-edit menu lets you quickly select what you want the controls to do, and you can drag and drop to swap the controls around. 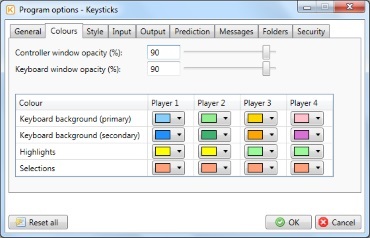 There are plenty of options too for changing the colours, translucency, style and behaviour of the Keysticks windows, how the word prediction works, the sensitivity of the controls, and so on. If you think of another option you'd like to see, let us know!